In an epic finish to the 18/19 season, Tiffin’s lower squad has stormed the Surrey League placing First in Prem B, First in Div 3 and Second in Div 5 securing promotion for all three teams. Coaches Mick and Clare were brimming with pride at the Tiffin End of Season Awards night on Saturday. It was testimony to a job well done from all involved, but most certainly from the coaches. Next season Tiffin will have teams in Surrey’s Prem A, Div 2 and Div 4 leagues and we couldn’t be happier about it! If you think you’d like to be a part of the action, get in touch with us and give us a spin at welcometotiffin@gmail.com. Surrey A Wins Premier B league securing promotion! 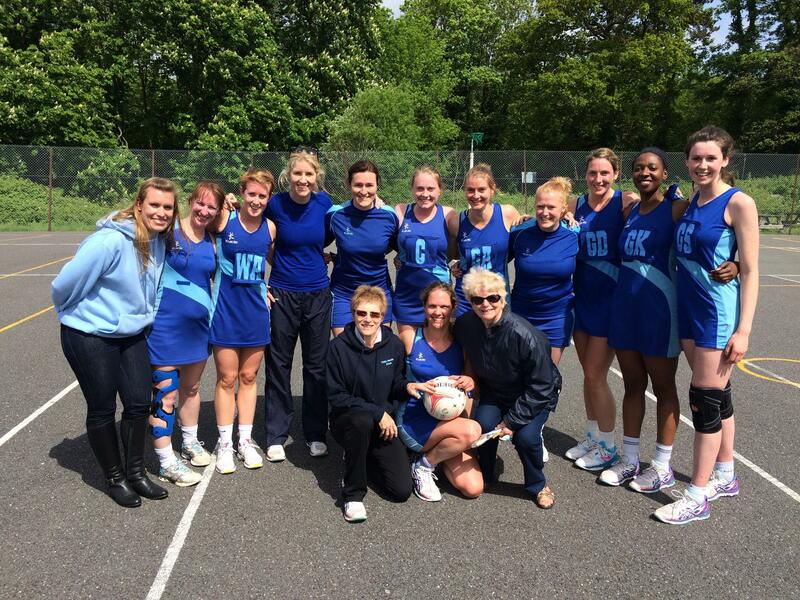 In the tightest league competition in years (just 5 points between the top and 4th team in the league), Tiffin Surrey A has taken the title in Premier B division securing their rise to the top division in the Surrey Netball League. In what was a super season that tested the team versatility and tenacity, with many a game being played with a flat 7, the team will be celebrating their win in their end of season party on Saturday night. Their coaches Mick and Clare must be thanked for their massive effort behind the scenes making sure we fielded the strongest possible side each week, and for their fantastic advice and support during the season. A huge thanks must also go to our fantastic scorers/timekeepers Pat and Gwen whose regularity showing up at our matches ensured that we could field all 7 of the players at the match. We’re super excited about trials this year. Netball in England is on the rise and we’re feeling super inspired by our amazing Roses! Hands up who can’t wait to channel their inner Serena or Jo! 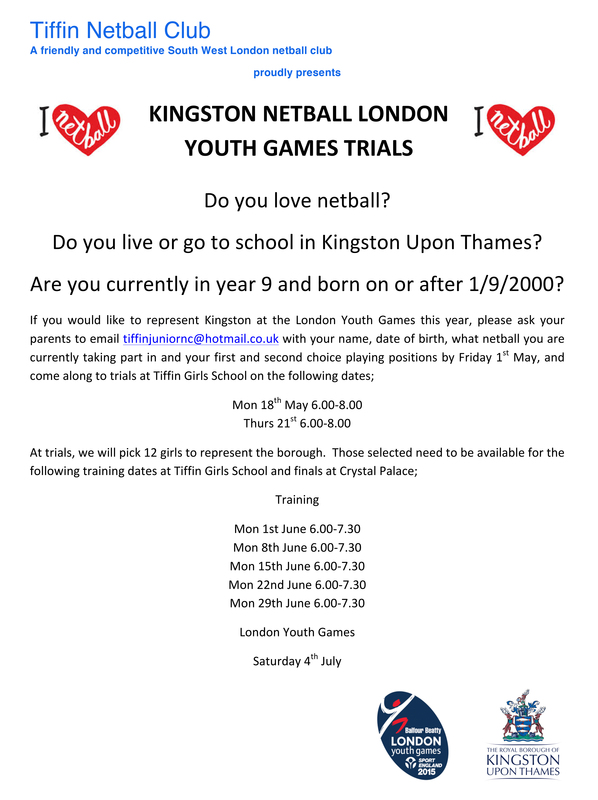 We know netball trials can be daunting and lots of women have a go and it can put them off forever. It’s daunting even when you’re already part of a club! So this year, we’re taking a slightly different approach. 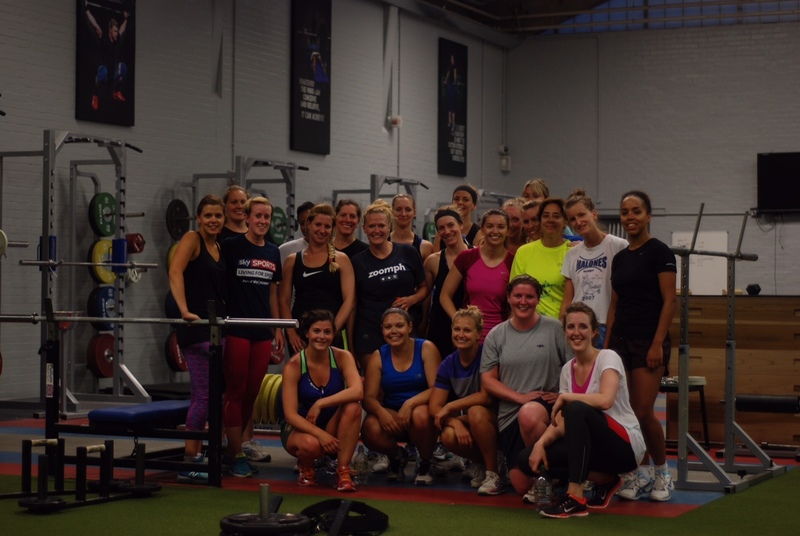 We want you to come and try us out on Saturday 16th June and Saturday 7th July. We are of course looking for experienced players, 4 of our 6 squads enjoyed promotion in the Kingston and Surrey leagues in the 2017/18 season. We need awesome shooters, centre court and defenders across the club to help keep Tiffin on top. However we aren’t planning on turning anyone away. If you’re keen, we’d love for you to stay on and for a few quid a week take part in our pre-season training over the summer. We just want to help as many women have the opportunity to have fun and improve their fitness playing netball in the sunshine, dreamy! If you do come and feel completely out of your depth, that’s completely fine too. England Netball run an amazing scheme called Back to Netball that is aimed at getting women back into the sport and we’ll make sure you know where it’s happening locally and when you’re ready, we would love you to come back. For those aiming to play competitively, it’s a good idea if you can get along to both dates, it means that you can get to know the players better and the selectors have a better chance to see you play in different combinations. We are one of the largest and oldest clubs in London. We run six senior squads (Regional, County, Surrey A, Surrey B, Tiffinettes and Tiffin Gold) and have the most amazing junior club. Players come to Tiffin and stay… Jules….26 years in blue? Our lower squad trains on a Monday and upper on a Tuesday. In the winter, we are lucky enough to train indoors at Holy Cross School in Kingston. Matches are played on Saturdays Sep-April. Last year subs were £210 for the year which includes England Netball affiliation and insurance, summer training, indoor training throughout the winter and league fees. For those studying, Tiffinettes and students, it’s £110. There may be increase depending on our facility hire costs but it’s there or there about. We also offer the option to spread the costs across a few months. We are very social and have monthly wine nights plus whole club and team socials. In 2019, we’re also going on tour to Liverpool to watch the Netball World Cup. We hope you’re as excited as we are to come and try us. Please fill out the link below to help us plan to make this the best experience for you possible. Tiffin As guaranteed their place in the County League last weekend, thanks to beating Barnes and Karisma in the Playoffs. After a successful season, and finishing the Prem A league in second place behind current county team Cobham, the As fought to victory last Sunday morning, and will now be in County for 15/16. 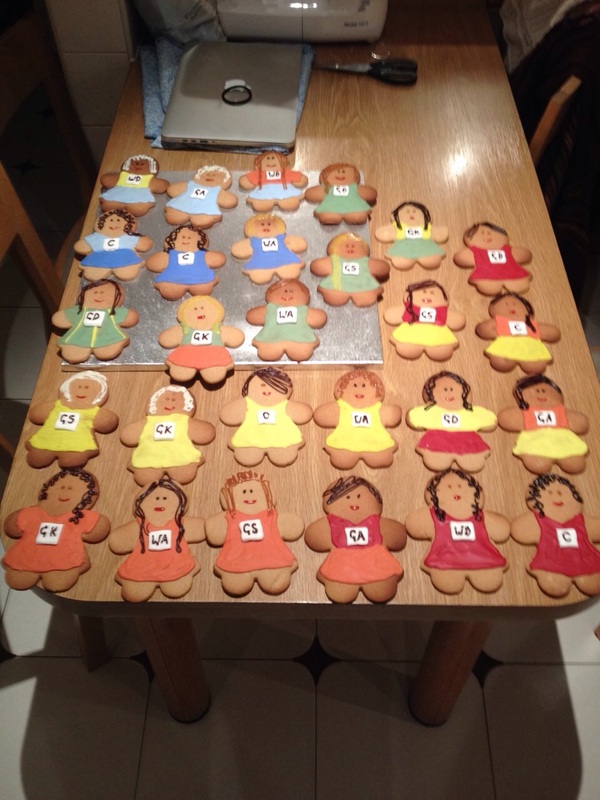 This means Tiffin Netball Club’s top two teams take their places in both Regional and County Leagues for the forthcoming season… making Tiffin one of the most successful clubs in the area. The team played excellently, brill defence and pressure all the way down the court, and the with the shooting on form, we finished the day unbeaten. Good work by everyone, including the wonderful supporters, who came out in their numbers and took to the side-line, giving us, the always useful, 8th player! We’re all over the moon with our achievement this season, our team’s aim was to get to playoffs, and despite the number of hurdles, including some terrible injuries (Clare B) and with babies on the way (Sophie W) we stepped up, got to playoffs, and won them! Such a beautiful morning for the last game of the Season, the sun came out and the shots started to flow, let’s hope it stays out now throughout the Summer League, and roll on into the new season. Great day all round, even the Pizza and Prosecco after the game, we’re all super excited about the season ahead. Go Tiffs! Interested in playing for Tiffin? Trials are being held on Saturday June 27. 10am-1pm. 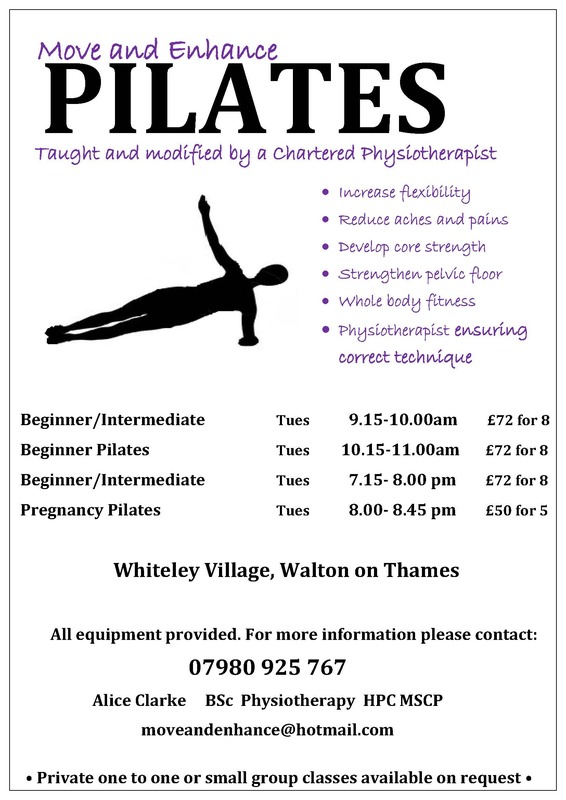 Ex-Tiffin player Alice is now running Move & Enhance Pilates classes in Walton on Thames. Please see below for full details and do get in touch direct for more information & to book your place.